The 1720 CCS TR brings extra agronomic benefits to producers wanting to utilize the benefits of twin row planters. The 1720 CCS TR stack-fold planter is equipped with Pro-Series TR units and available in 12 twin-row configuration. 36 or 38" on center row spacing can easily be switched back and forth to plant single or twin rows. The 1720 CCS TR brings the productivity of the Central Commodity System. Included is the unmatched maneuverability, narrow transport, and convenience of the integral, stack-fold planter to the twin-row market that can easily be folded right from the cab. The three-section frame design can flex for rolling ground and terraces or locked rigid for planting on beds or flat ground. 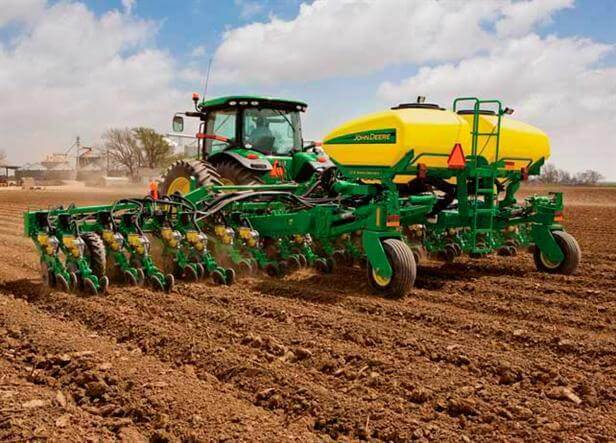 1720 CCS Planters work well in conventional or reduced tillage field conditions and are ideal for planting into beds or strip-till conditions.